You can run 40:1 on a rec boat with mild mod compression. I personally run 40:1 on my Stage II GPR. 150 psi compression, no porting. At my 100 hours inspection, everything looked great ! Piston skirts, powervalves, cylinder walls ect. Keep in mind also> ! * The OEM oil injection is set to run 32:1 at W.O.T. Dang you answered it all. Did you take pictures of your engine at 100 hours? I know you had some at around the 70 mark. Hmmmmmmmmm. I would like to see those Please. I can't find the powervalve pics just yet, but trust me, they looked PERFECTLY CLEAN !!! no gummy deposits or carbon buildup!! I was amazed !! 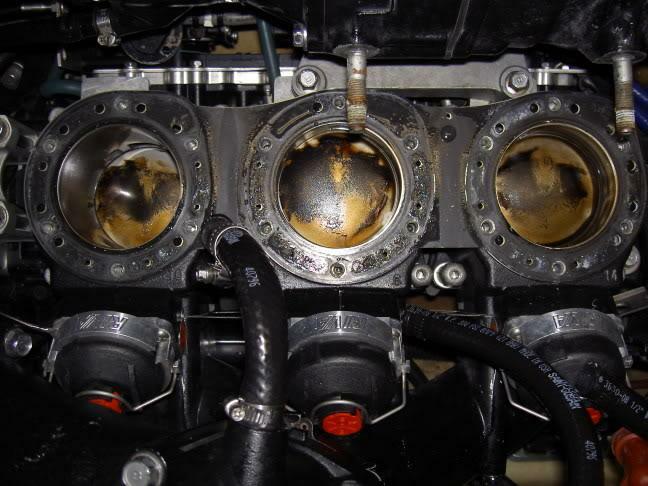 When we installed cajundude's gas valves a couple of years ago, he had 85 hours on the motor [Amsoil]. His too looked extremely clean. My piston skirts at 100 hours had no scratches at all. I expect to get atleast 300-400 hours out of my motor by just doing rerings every 100 hours for a peice of mind. Whats a good ratio for pre-mix? What Pre Mix is Best? and at what Ratio?